I invented a thing, at least I think I did. There is no short way to describe it, so it gets a blog post. 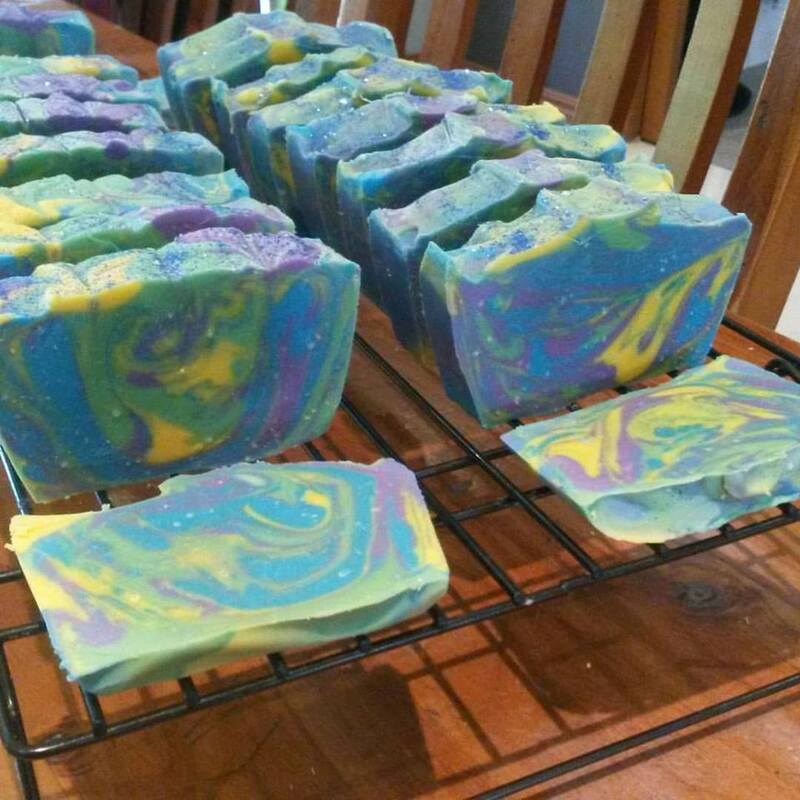 I use a lot of essential oils in my soap varieties because I like things that smell nice and I like creating combinations of colours and scents and names in my soaps. But not everyone likes a scented soap, and some essential oils are contra-indicated in pregnancy or can cause irritation in some people. So I wanted to make sure that anyone who prefers not to use essential oil soap has plenty to choose from as well. 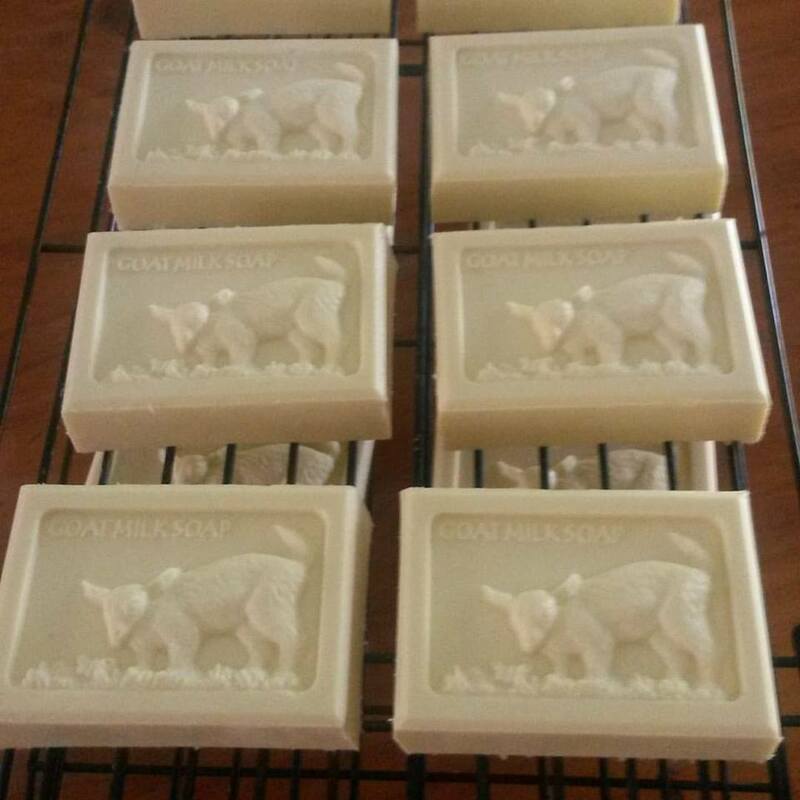 My soaps are made with 25% whole raw goat milk. I had heard that yogurt was great in soap, and had that in mind to try. I know many soapers use tea in their soaps as well, and green tea in particular is said to be great for the skin. I don’t know how I got the idea to combine milk, yogurt and green tea in a sort of perfect storm of soap liquids. It starts like this. The milk needs to be heated to 90 degrees and then cooled so that the yogurt culture can digest the proteins. During this heating and cooling I infused the milk with regular green tea. Infusing the milk with green tea, prior to adding yogurt culture. The next step was to wait 12 hours for the culture to do its work, then measure the yogurt into containers and freeze it. After that all that remained was to make soap, substituting my usual 450g of milk for 450g of yogurt. 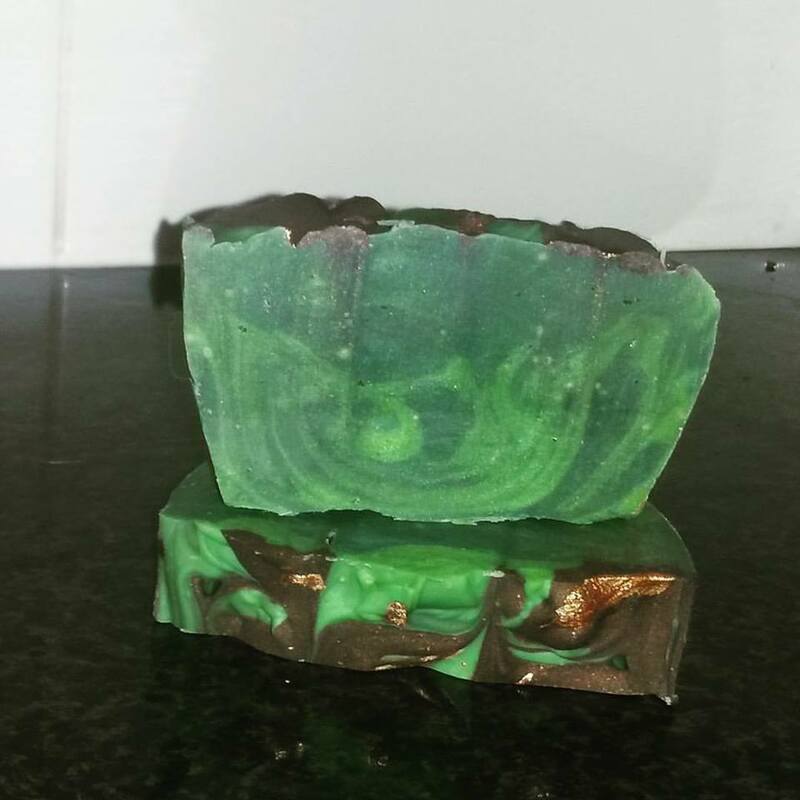 I wasn’t sure what colour I would end up with, so I decided to add a 10% green mica swirl so that if it came out very pale I would be able to easily distinguish the yogurt soap from plain milk soap. Even with the lye fully dissolved and the yogurt completely melted it still looked nasty. Yogurt and lye mixing complete… ew. Normal milk and lye mixture. The oils were ready… the stick blender was on standby… I decided to press on. I mixed it all together and it started to look less like dysentery and more like soap. In the jug, at trace, ready to pour. I separated 200g and added the mica colouring with a bit of olive oil, then poured the soap into the mould. A little bit of artistic fiddling and it was starting to look okay. The soap in the mould. And with the dividers inserted. And cut, tidied and on the curing rack. The first batch I made was in the loaf moulds. I chose this soap to try out my new slab mould knowing that in spite of the scary vomit phase, it is a fairly well-behaved recipe. It moves slowly, so it doesn’t get too thick to pour before you’ve got the colours mixed, and it is runny enough to give good concentric circles when you pour the colours alternately in the middle of the mould. It sets up fairly quickly once it starts to cool and doesn’t overheat easily, giving you time to get the pattern done and get it into the freezer. It hardens fairly quickly too, allowing you to unmould it (and cut it if done in a loaf mould) the day it is made to see how the swirl worked on each individual soap. There are a few different ways of getting yogurt into a soap, some soapers use it unfrozen as all or part of the liquid, some simply add a couple of tablespoons to the mix at trace. I like this method of switching all the liquid for yogurt, as it maximises the amount of yogurt and green tea in each bar, while maintaining a 25% milk content. In use I found it very cleansing, giving a really clean feeling in the shower. I expected it to be a little drying as a result, but it actually leaves that fresh, dewy feeling on your skin, similar to the super-moisturising avocado soap Holy Guacamole, but without that slightly oily undertone that comes from the high avocado oil content. Green tea is rich in antioxidants, and is said to be detoxifying and hydrating, which is certainly the impression I got from using this soap. Yogurt is claimed to be almost a cure-all when applied topically, and although the cultures probably don’t survive the saponification process, the lactic acid and other fatty acids found in goat milk are also great for the skin. It will be sold as simply GTGMY, short for green tea goat milk yogurt. I think every aspect of the process is equally important and should be included in the title. Some customers who have bought the early release are already referring to it as ‘the yogurt soap’, but it it is GTGMY to me. I have been making soap for two and a half years now. That’s quite a long time. 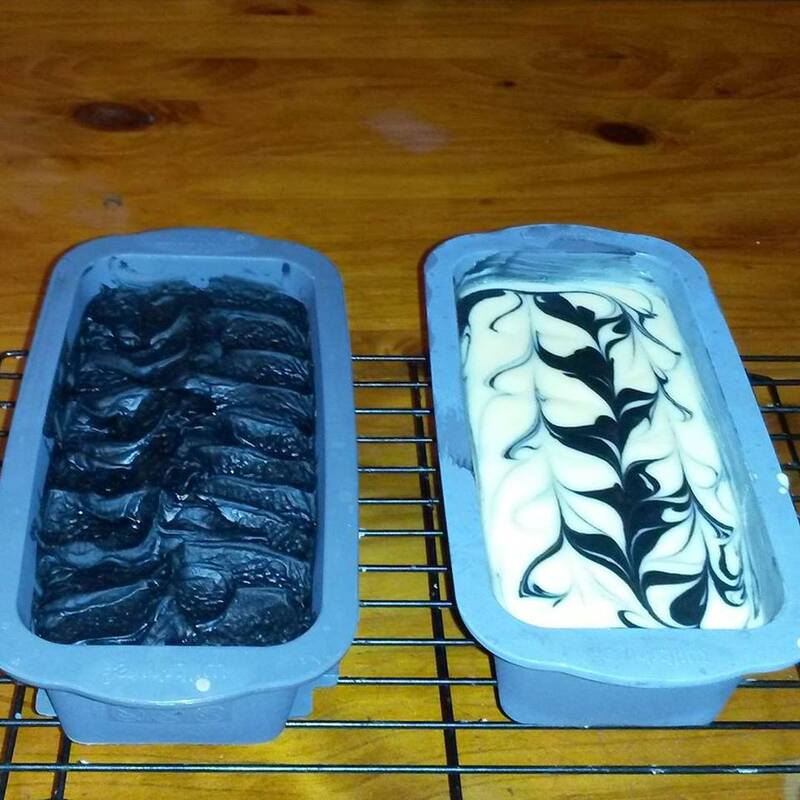 I wrote a post about the first batch of soap I made way back in March 2013. You can check it out here. Since then I have made about 800 bars of soap. I’ve got my NICNAS registration and started selling to family, friends, workmates and at the very occasional public event. In a couple of weeks I’ll be at the school Christmas market, which is quite exciting. In that time my soap has gone from looking like the ones in the link above to single colour swirls and basic natural scents to complex themed essential oil and colour combinations. And until last week I hadn’t lost a single batch. Soapers talk of a phenomena known as ‘soap gremlins’. It’s when soap develops a mind of its own and things go awry. Seized (super fast thickening), discoloured or overheated batches, dropped mixing bowls, missed fragrances, anything that stops your masterpiece from manifesting as you had intended. And they tend to come in a series of two or more disasters. I’ve been stocking up on a lot of old favourites with Christmas, the school market and next year’s Rural Lifestyle Expo in mind. Two popular natural varieties, Holy Guacamole and Bee’s Knees, should have gone off without a hitch. But I made a couple of bad decisions. Holy Guacamole features avocado oil and the flesh of a whole avocado in the mix. It turns out a kind of booger green. 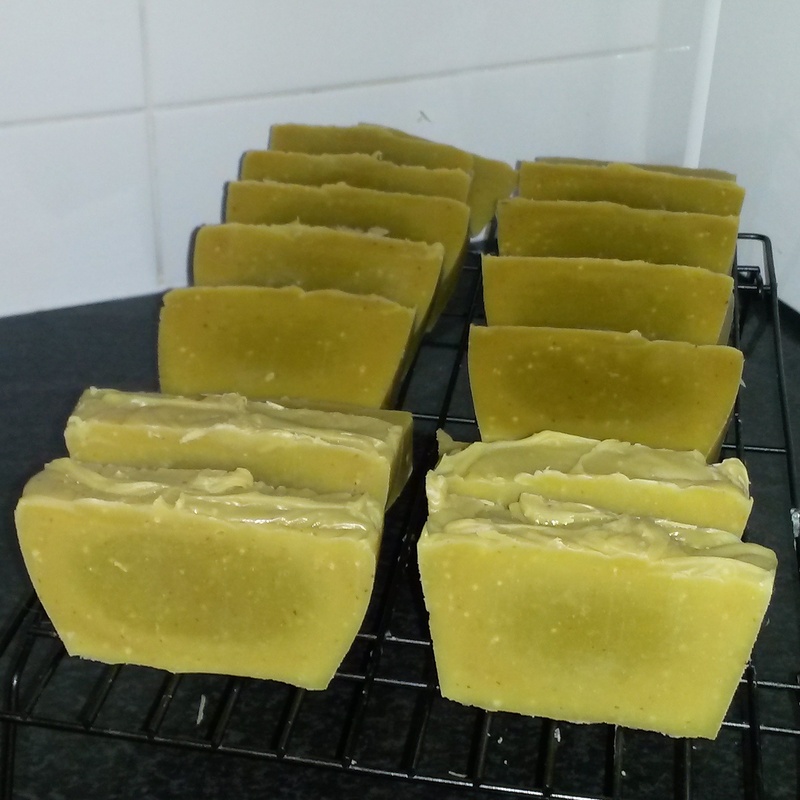 It is probably the ugliest soap I make, but it is super moisturising and leaves that dewy feeling on your skin without being greasy. I usually let it heat up naturally to gel phase to speed up the cure, but this time it didn’t heat up on its own. So I gave it a bit of help by putting it in the oven. 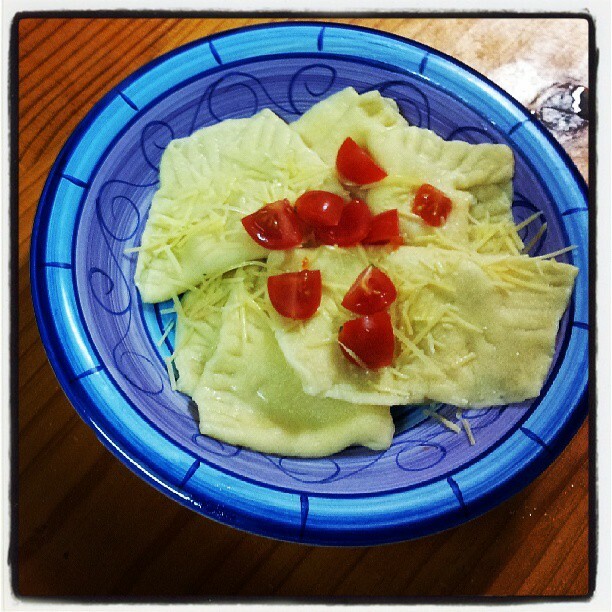 When I unmoulded it the next day I found that I had burned the edges. It had a thin layer of nasty brown goo around the top. The rest of the soap was fine, but it looked bloody awful. The best option was to slice off the top layer, leaving a smaller bar. To compensate for this, I cut the batch into 12 bars instead of 16 to make up for the lost weight. So the bars are nice and fat, with flat tops. And they should still work perfectly well. Holy Guacamole, not a beauty even when successful, but feels great to use. My next mistake was on the honey soap. The batch stayed beautifully cool and kept the creamy look. I had the bright idea of putting it in my cute new 12-bar mould with the goat kid on it. The soft, sticky soap stayed in the detail parts of the mould when I popped it out, and left sad blurry goat kids on the top of each bar. I had never done a rebatch before, but a newly made, otherwise perfectly good batch of milk and honey soap seemed like a good place to start if I wanted to save all the ingredients and have a saleable batch of a popular variety. I did some research and decided to go with the stove top method. I grated up the soap, put it into oven bags and put the oven bags in a big pot of boiling water. Once it had all melted down I snipped a corner off the bags and squeezed all the molten soap into the moulds. Then it was fingers crossed and don’t look at it for at least 12 hours. It turned out okay, some people have even said it looks better than the original (thanks guys). I’ll test it in a day or two and see how it goes. Then on Saturday I woke with an idea. I pictured a creamy, mostly white soap, with a light brown and lilac swirl. I had been trying to figure out a way to lighten-up a combination of frankincense and patchouli essential oils, and I had the idea of adding lime. I decided to risk a hanger swirl with two colours. The essential oil combo turned out better than I expected, it smells amazing, and applying the colours turned out to be a bit of a learning experience. But in the end I am happy with how it turned out. 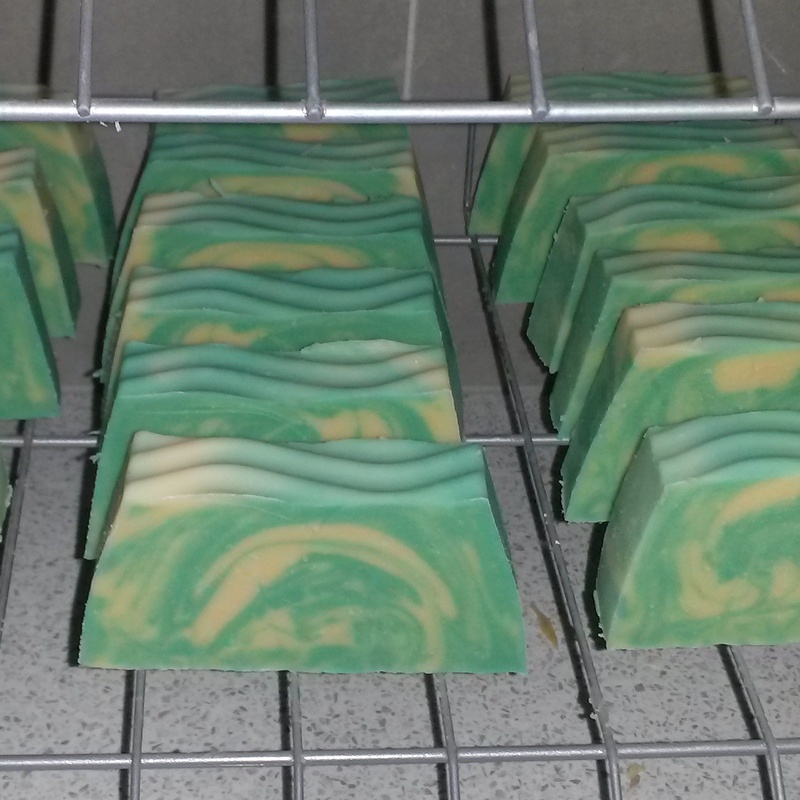 New, still unnamed variety with frankincense, patchouli and lime. Here are a couple of my recent creations that I am a bit proud of. I’ve never really been much of a crafty person, but I enjoy making things that are useful, good for you, enjoyable to use and also look good sitting on your sink or in your shower. I’ve been able to help a few people with skin problems along the way. Tie Dye – four colour in-the-pot swirl with clary sage, patchouli and lavender. Plain four-ingredient goat milk soap, dressed up just a little with this cute goat kid mould. Kidding time is always tough on my hands. The combination of milking, feeding, cleaning pens and constant hand washing always leaves my hands very rough and dry. It usually takes months for them to return to some kind of normal. This year I took some excess colostrum from one of my does at 12 hours post-kidding. It was amazing, thick, yellow stuff. After her three kids had consumed all they could for 12 hours, I milked off about a litre and a half. Enough for an emergency supply and two batches of soap. Colostrum is the first milk produced by mammals, usually formed in the weeks to days prior to giving birth. It contains important antibodies for the offspring, which are absorbed through the gut in the first few feeds. This is referred to as ‘passive transfer of immunity’ from mother to baby. It provides the antibodies specific to the environment that the animal is born into. I had not soaped with colostrum before, but I had read that it was even more of a challenge to use than milk. Milk, if you are not careful, will burn and discolour during the soapmaking process. I froze my colostrum solid and expected to get a fairly manky colour in my soap. I wanted to fast-track part of the batch by allowing it to heat up, so I decided to add activated charcoal to give a black soap and hide any discolouration. 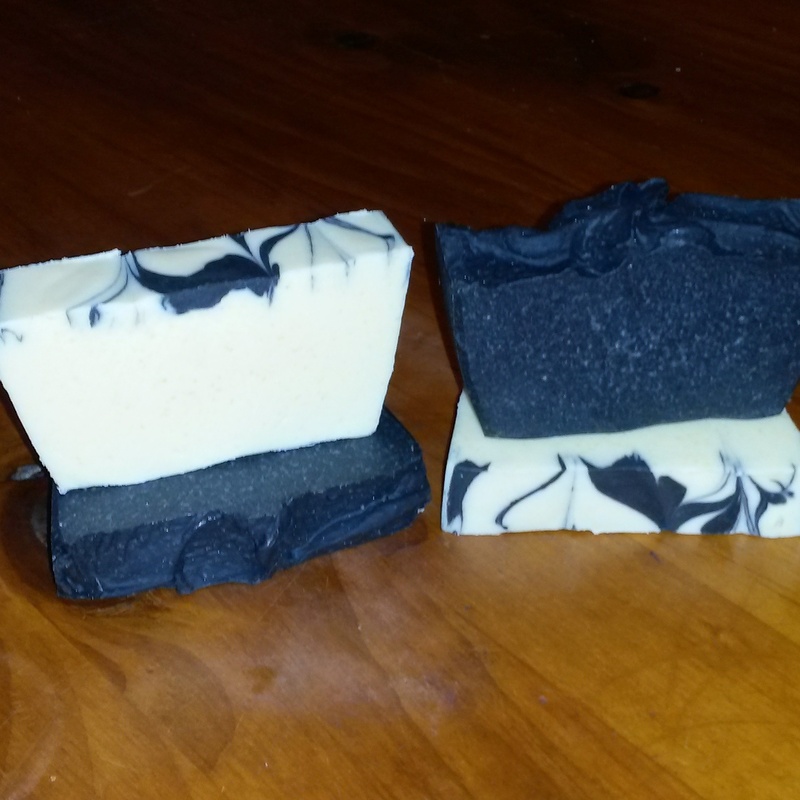 Activated charcoal is used in soap for its ability to absorb toxins from the skin, it is also a safe and easy way to get a uniform black colour. The frozen colostrum did mix in very slowly and very thickly with the lye. I split the batch and added the charcoal to one half. I had a bit of black batter left over after pouring the uncoloured half, so I drizzled it on the top and made a bit of a contrasting swirl. I put the black one in the oven just long enough to make sure it had heated all the way through, causing it to ‘gel’ and speed up the cure. 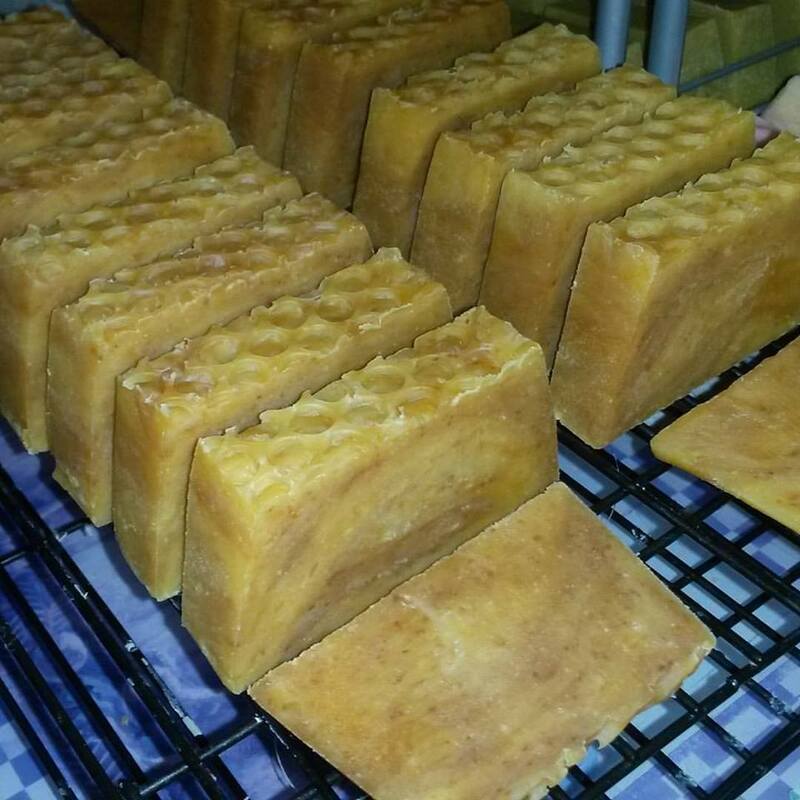 The colostrum soaps in the moulds. But surprisingly, the white half stayed pretty white. It got an hour in the freezer to make sure it stayed cool, but it played very nicely. The large particles in the colostrum made both soaps slightly rough in texture, but once cut they turned out to be quite attractive soaps. The white soap will get the requisite six weeks’ curing time before use, but I’ve been using the black version already. I put an offcut piece on the soap rack in the laundry and I use it every time I come in from tending to the goats or gardening. To be honest, it gives a very grey lather, due to the charcoal, but this rinses away easily. I wasn’t expecting much, but it didn’t take long for my hands to notice a difference. Usually I try things like large amounts of hemp cream left to soak in while I watch a movie, or regular applications of my usual facial moisturiser. But all I have used for the past week or so has been the black soap. And my hands almost feel like hands. They are steadily improving, and while still a little rough they are not cracked or sporting areas of ground-in dirt. Colostrum’s claim to fame is a component called lactoferrin, which some go as far as to claim can cure cancer. It is widely accepted as being a great immune booster. Applied topically, as a cream or in soap, it is meant to be great for eczema and psoriasis. All I know is that my colostrum soap seems to have made a big difference to my hands. I have made a new website with Weebly. So far I have the soap and goat info up, but I hope to add things like recipes and skills for sustainable living. 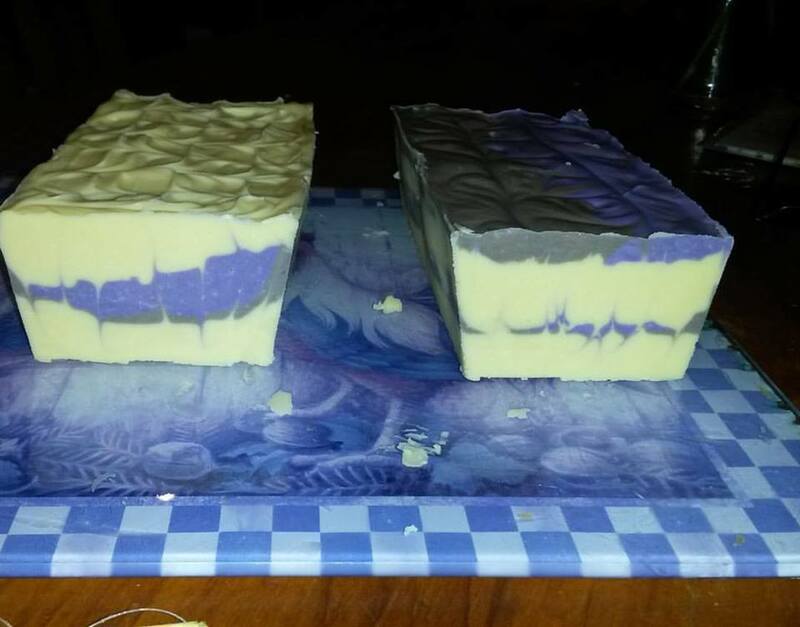 I have linked below to the page where you will find information on my soap which will soon be for sale, but you can navigate around the site from there.